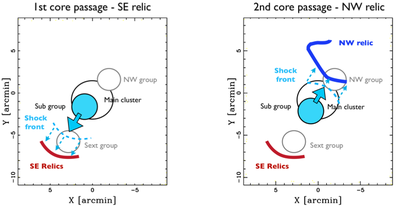 PLCK G287.0+32.9 is the second most significant SZ detected cluster of the 20 new clusters in the Planck Early Release Catalog (Planck Collaboration et al. 2011). Bagchi et al. 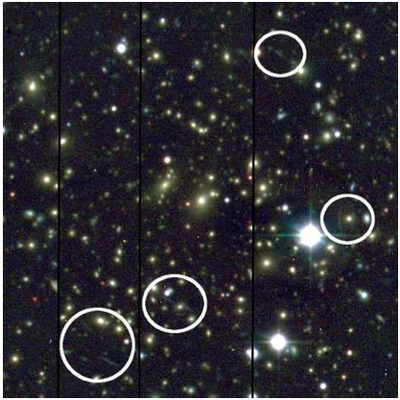 (2011) observed PLCK G287 with GMRT at 150 MHz and VLA at 1.4 GHz and discovered a pair of "arc"-shaped peripheral radio relics, that have a very large projected separation of ~4.4 Mpc (they estimated the redshift of the cluster using Fe-K lines in the X-ray). 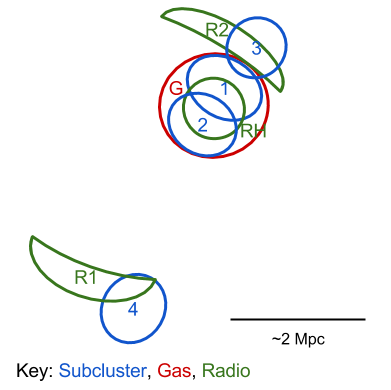 They also identify a potential radio halo closer to the cluster center. Bagchi et al. 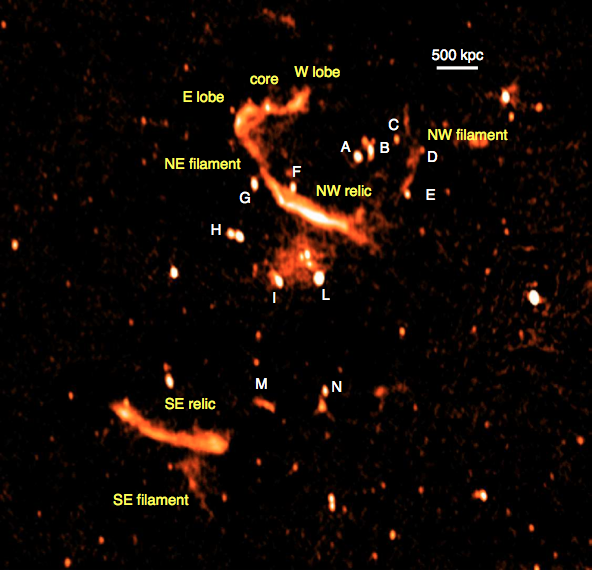 (2011) found corroborating evidence for PLCK G287 being a post merger system with optical imaging from the IUCAA 2m and a shallow 10 ks XMM-Newton observation. 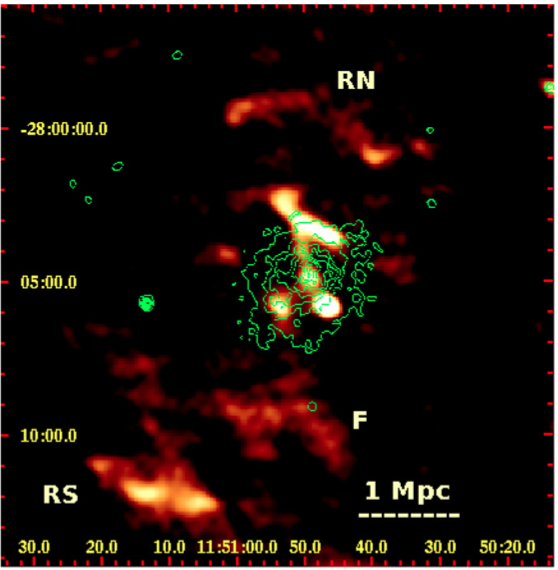 They estimate a SZ and X-ray based masses of M500 = 25 +/- 1 e14 and 26 +/- 1 e14 Msun, respectively. These masses are consistent with the weak lensing based mass of Gruen et al. (2013): M200 = 53 +/- 13 e14 Msun and M500 = 28 +/- 5 e14 Msun. Gruen et al. (2013) also noted a number of exceptional strong lens arc-like features. The two most separated features are ~165" apart. This is much larger than the expected Einstein radius of ~37" given the 68% upper confidence NFW fit and assuming a source redshift of 5. Thus it is called into question whether these arcs are actually multiple images. Bonafede et al. (2014) observed PLCK G287 with GMRT at 150, 325, and 610 MHz. They determined that the northern most relic identified by Bagchi et al. (2011; RN) is actually a radio galaxy with two lobes and some other point sources, however the northern relic closest to the cluster and the southern relic (2.8 Mpc from center) are confirmed. Bonafede et al. 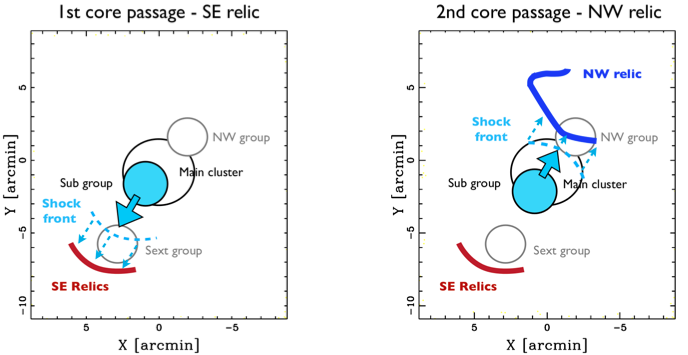 (2014) make the argument that the small projected distance of the northern relic and the large projected distance of the southern relic is due to two separate passes of a merging subculture (mass ~0.1 of the main cluster). They also make some claims based a color magnitude selected galaxy sample that there are two subclusters in the central region and evidence for a north and south filament each containing a group. Based on Bonafede et al. (2014). Planck Collaboration et al., 2011. Planckearly results. VIII. The all-sky early Sunyaev-Zeldovich cluster sample. Astronomy and Astrophysics, 536, p.A8. Bagchi, J. et al., 2011. 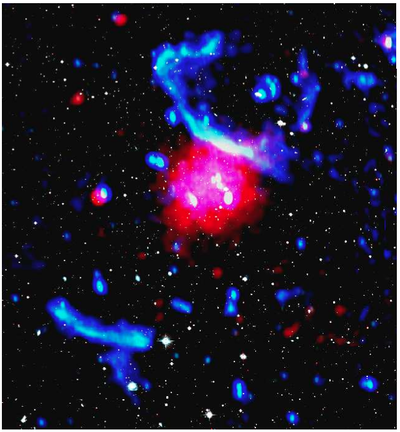 DISCOVERY OF THE FIRST GIANT DOUBLE RADIO RELIC IN A GALAXY CLUSTER FOUND IN THE PLANCKSUNYAEV-ZEL'DOVICH CLUSTER SURVEY: PLCK G287.0+32.9. The Astrophysical Journal, 736(1), p.L8. Gruen, D. et al., 2013. 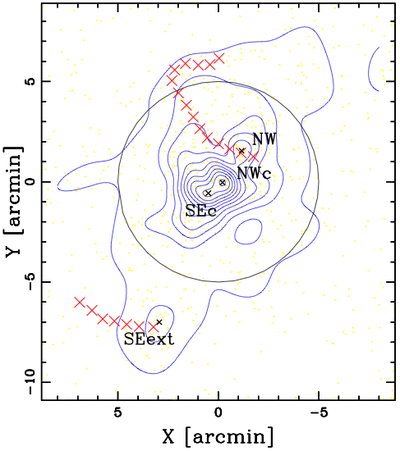 Weak lensing analysis of SZ-selected clusters of galaxies from the SPT and Planck surveys. eprint arXiv:1310.6744. Bonafede, A. et al., 2014. Evidence for particle re-acceleration in the radio relic in the galaxy cluster PLCKG287.0 +32.9. eprint arXiv:1402.1492.